Jimmy Dean Sausage Crumbles really cut the prep time on this dish in half. If you don’t have to worry about spending time cooking and seasoning your sausage, you can dedicate that time to stuffing these bites or stuffing your face. I admit it — I did both! t Super Bowl season is upon us. I know, it feels like we’ve just dug out from under the holiday baked goods only to be tempted by the biggest snack day of the year. Hey, if you’ve stuck to your resolutions this far, you deserve a day off — so you might as well reward yourself with a tasty touchdown like our mini nacho bites. t During this year’s game, make the extra effort to dress up those chips and salsa. Give them a chic tapas makeover and pre-stuff mini nacho bites for everyone. That way, you won’t have to worry about who gets stuck with the naked chips on the bottom once all the cheese and topping have been demolished. Warm the Jimmy Dean Sausage Crumbles in a skillet until they begin to sizzle, for about 8 minutes. 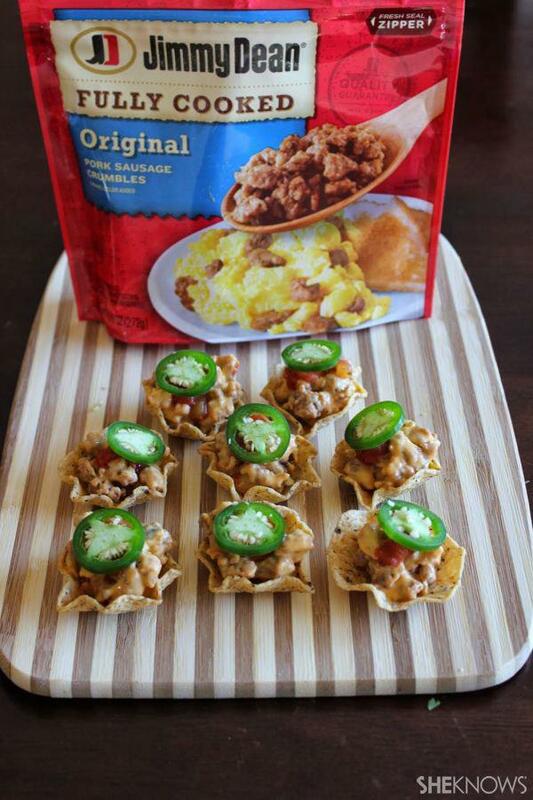 Add the Jimmy Dean Sausage Crumbles to a large mixing bowl with the nacho cheese. Stir them together. Lay the corn chip cups out on your presentation surface. Add a small spoonful of the sausage and nacho cheese mix to each cup. Top each cup with a small drop of salsa, then top that drop with a jalapeño slice. t Thanks to Jimmy Dean Sausage, this recipe is simple to make, and it provides a much more enjoyable feasting experience for your guests. I hope you enjoy these with your friends, family and teammates during the big game.